There’s a very common misconception that weight loss surgery is “the easy way out,” that people who choose it are “lazy,” or “don’t want to put in the work.” Underlying this is another misconception: that weight loss is easy and simple, and all you have to do is eat less and move more. None of this is true. Weight loss is not easy or simple, not even on Paleo, and especially not for people living with morbid obesity. Weight loss surgery is also not easy or simple, and most people who choose it have already tried to lose weight the “natural” way many times with no success. If anything, weight-loss surgery is putting obese people on an even footing with naturally thin people, not “cheating.” Obesity comes with physiological changes that make the body resistant to weight loss, regardless of how little you eat or how much you exercise. Bariatric surgery works partly because it addresses those. For example, weight loss via bariatric surgery reduces the hormonal starvation-stress response that makes weight maintenance so difficult. It improves insulin sensitivity even before significant weight loss actually happens. It addresses problems that make obese bodies resistant to weight loss, like appetite, hunger, food-storage hormones, and gut flora composition. If anything, it’s just leveling the playing field. Of course, all of this comes with the chance for significant side effects (ranging from constant nausea/vomiting to gallstones to incontinence to all kinds of other surgery complications); that’s why bariatric surgery is something you discuss with a team of doctors for months beforehand, and not something you jump into overnight. But this isn’t an article about whether gastric bypass or a lap band is right for you; it’s really about the all-important question of what you eat after the surgery. Your diet post-bariatric surgery will make or break your success with the procedure, so how does Paleo stack up? Weight-loss surgery is exactly what it says on the tin: weight-loss surgery. It’s not health-creating surgery, disease-curing surgery, or magical-life-improving surgery. It’s also not solve-all-your-emotional-eating-triggers surgery or cure-your-sugar-issues surgery. It can help address some of the physiological issues that make it so hard to lose weight, but that’s about all it does, and in the long term, it won’t cause sustainable weight loss unless it’s used as a springboard to change your habits. Weight regain after bariatric surgery is fairly common (20-30% of patients either never lose weight or regain it). Sometimes this is caused by surgical complications, but the most common cause is diet creep: instead of using the surgery as a kick-start to make new eating habits, patients slip back into old eating patterns. This doesn’t mean they’re lazy or stupid: often there are pre-existing addictive behaviors around food or other problems that are difficult to address. But the fact remains that diet relapse is a serious issue that can negate the benefits of the surgery. Surgically reduce the size of the stomach (in one of several ways), so you physically can’t fit as much food into your stomach. Gastric banding (lap band surgery) or sleeve gastrectomy are examples of this. Restructure the digestive tract to bypass part of the small intestine, which reduces calorie and nutrient absorption. Roux-en-Y gastric bypass is an example of this. Dumping syndrome: when the size of your stomach is so rapidly reduced, food can sometimes pass from the newly-tiny stomach into the intestine before it’s digested, causing cramps, vomiting, and diarrhea. Nutrient deficiencies (caused either by malabsorption or just by the incredibly tiny amount of food you can eat). That makes diet tricky for a bunch of reasons. So how does Paleo stack up? As a post-surgery diet, Paleo actually does pretty well. 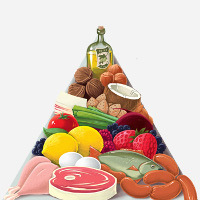 In fact, there’s even a bariatric food pyramid that looks a lot like a high-protein variation on Paleo! Getting into the habit of eating a modified Paleo-style diet is one of the better habits you could make, for several different reasons. High-quality protein and nutrient-dense greens…and it’s delicious! previous size (or even less), then every bite of food has to count nutritionally. You don’t have room to fill up on empty calories. Paleo is a very nutrient-dense diet because it cuts out a lot of the “filler” calories like refined flour and sugar, so it fulfills that requirement in spades. Paleo delivers lots of high-quality protein. Protein is one of the most important nutrients post-bariatric surgery, and Paleo delivers in in spades. Put down the lentils; pick up the liver. 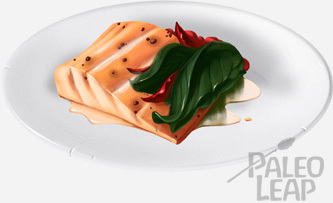 Paleo meals have low sugar content. Dumping syndrome is most common with foods high in simple sugars. Reducing your intake of sugar, especially liquid sugar, can help a lot with avoiding this. Paleo is good for sustainable changes. Paleo is a good diet for breaking the cycle of emotional dependence on sugar and dealing with other behavioral food issues. It’s not a magic pill, but it sure helps. If out-of-the-box Paleo doesn’t work for your post-surgery digestive system, then various different modifications might be helpful. Reducing or restricting vegetables may be helpful. Vegetables add a lot of volume, so they’re not always the best choice if your food quantity is extremely restricted. Some people can’t digest fibrous vegetables, especially raw. The typical recommendation to “fill your plate with vegetables” might not work as well for bariatric patients. Higher-protein, lower-fat can sometimes work better. Because protein is so important and stomach space is so limited, bariatric nutrition recommendations emphasize lean over fatty protein. Protein shakes may be necessary. Not everyone can manage animal protein right away; shakes aren’t the best thing in the world, but they’re a lot better than chronic protein-calorie malnutrition. Minimize the damage by getting a brand without a lot of added junk. Supplements will probably be a permanent addition. Even with the most nutrient-dense diet, many bariatric surgery patients will have to take supplemental nutrients (e.g. Vitamin B12) in the form of pills and/or shots for life. Bariatric surgery is a tool, not a magic solution – a lot depends on what eating habits you can make and stick to after the surgery. If it works for you, Paleo can be a great post-surgery diet to make the right diet and lifestyle habits stick and pack as much nutrition as possible into a surgically reduced stomach. Not everyone can manage all the Paleo staples, and it’s going to take some adaptation, but it’s definitely a great place to start.